More Record To Near Record Heat & I'm Ready For The Rains To Come Back. Looking West Towards Elk In The Southern Sacramento Mountains. Id bet that most of you who are reading this are looking at that picture and wishing/hoping that those rains would come back. I know I am. Our home in Carlsbad is still running below average for July with only .85" recorded so far bringing my year-to-date total to a sad 1.73". 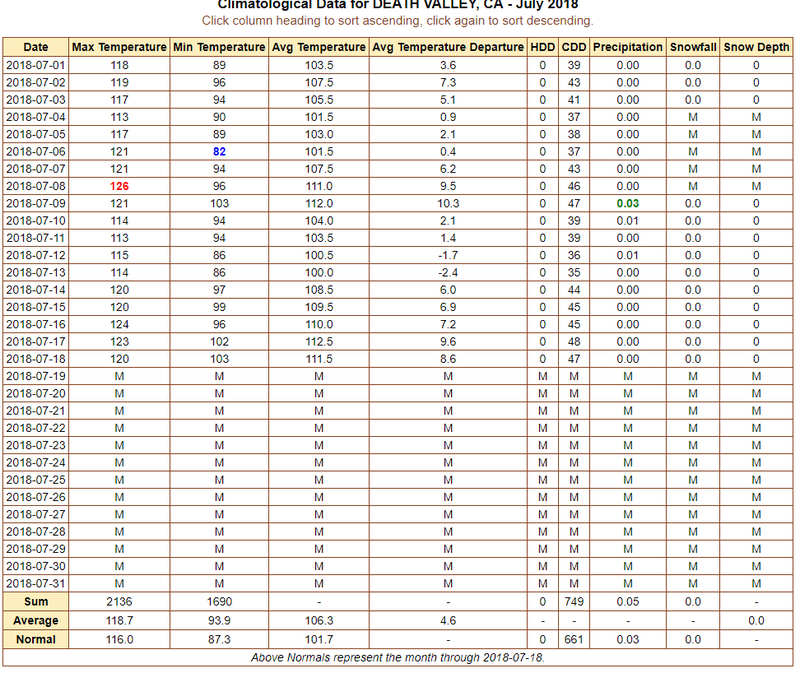 Compare this to Carlsbad's long term (1900-2018) climatological average of 1.87" for July and 6.51" from January 1st through July 31st. 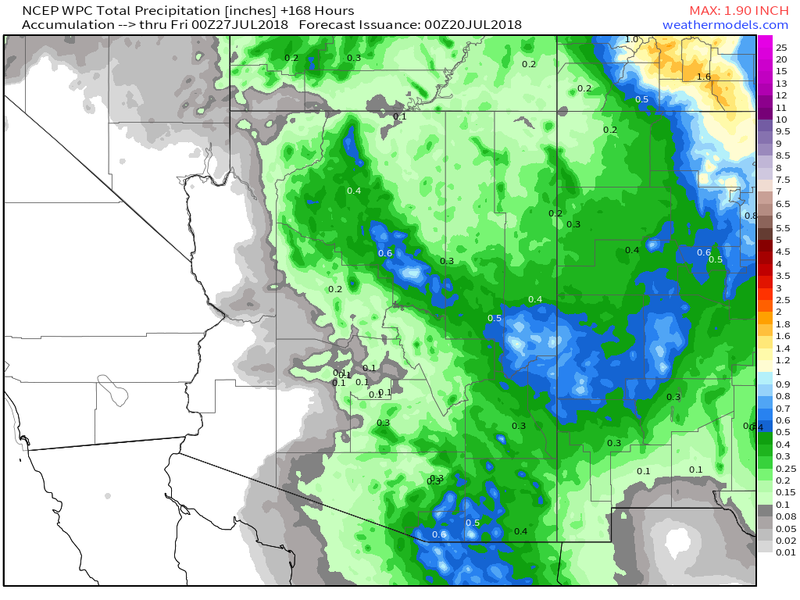 Preliminary July 2018 Rainfall Totals. Overall Chaves, Eddy, and Lea Counties are running below average thus far this month (as of the 19th). 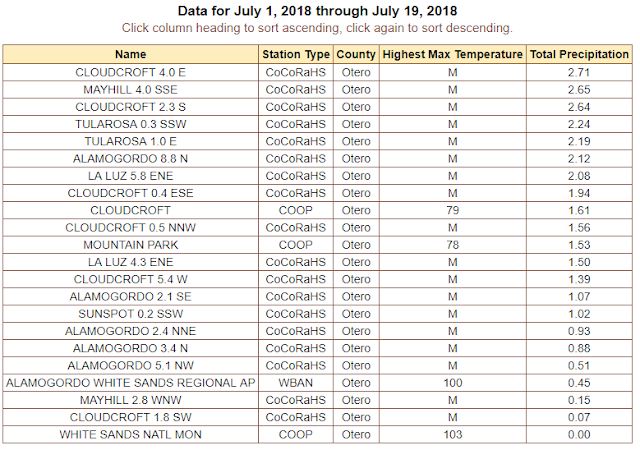 The Elk National Weather Service Climate Co-Op Station leads the pack for the month with 2.82". Compare this to their 1895-2016 July average of 3.09". So they are just about average. While other stations across the Southeastern Plains have barley received anything for the month. Ah the Sacramento Mountains...my favorite play to run away and hide. When we retire that's where we plan on moving to. 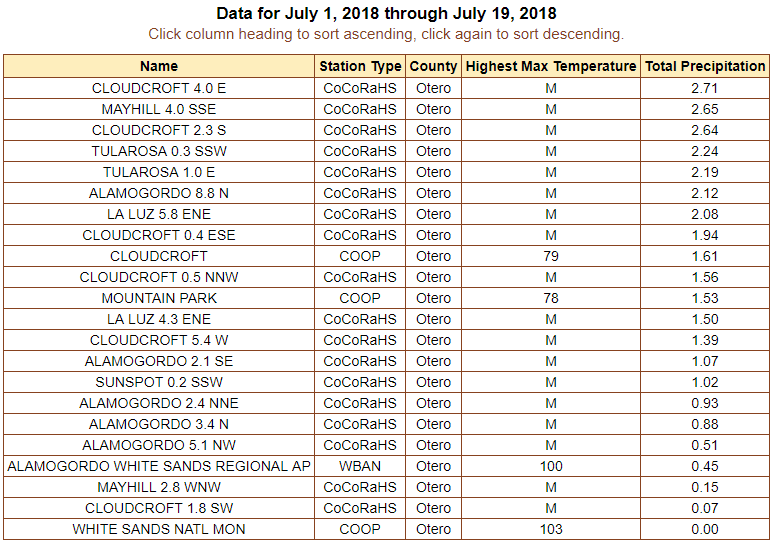 A CoCoRaHS Station located 2.9 miles southwest of downtown Ruidoso has recorded 3.02" of rain for the month thus far. While not far away the Sierra Blanca Regional Airport has had zip, zada, nada for the month. Goes to show you just how spotty our summer rains can be. Feast or famine rules the summer many times over. And more often than not this is normal. (As Of 4:45 PM MDT Thursday). Local Temps As Of 4 PM MDT Thursday Afternoon. Regional Temps As Of 4 PM MDT Thursday Afternoon. 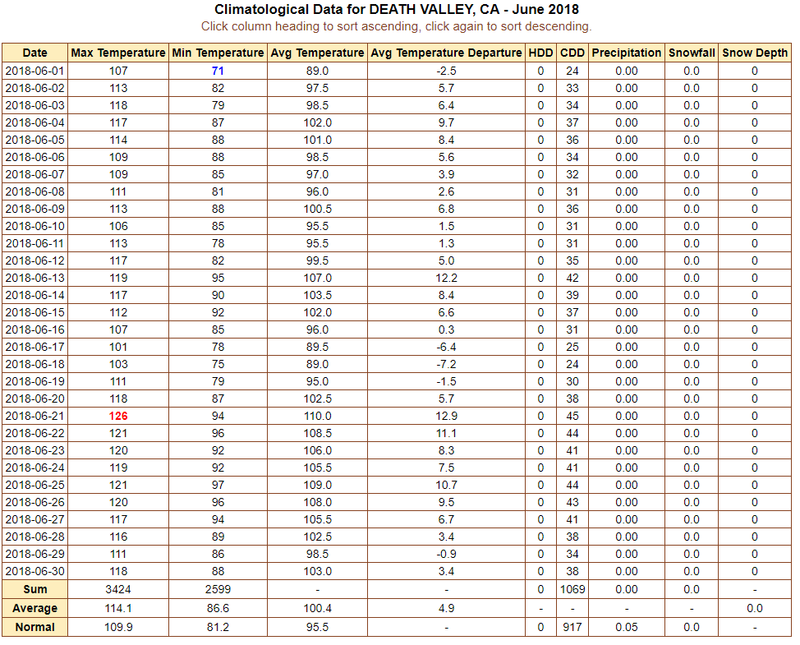 So far this afternoon we have managed to reach 106º here at our home in Carlsbad via my Davis Vantage Pro2 Plus Home Weather Station located in our backyard. 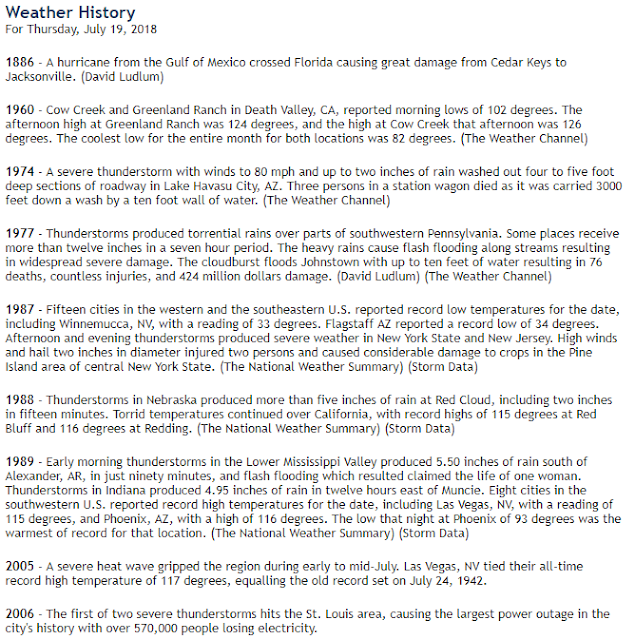 On this date in 1965 the Carlsbad Airport reached 109º for the official highest temp for the date. 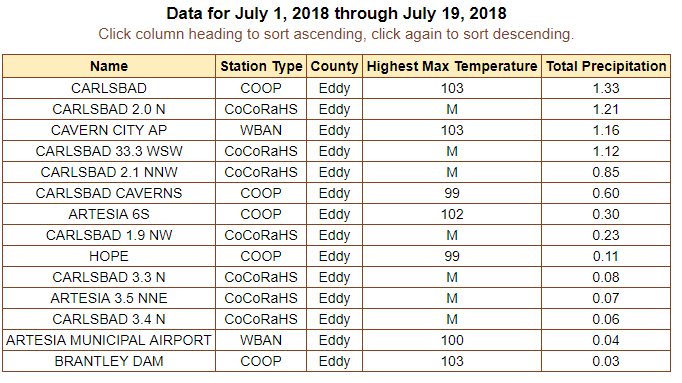 So far this afternoon the Carlsbad Airport has reached 106º (as of 5 PM MDT). Roswell also has made it up to 106º as of 5 PM MDT. 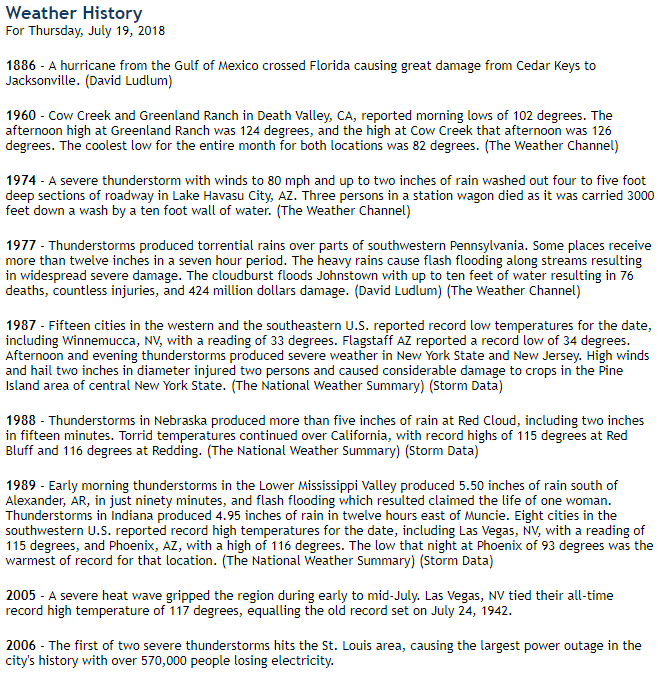 This breaks their all-time daily record high of 104º set in 1925. Gotta love this La Niña dry summer heat...naw I don't think so either. 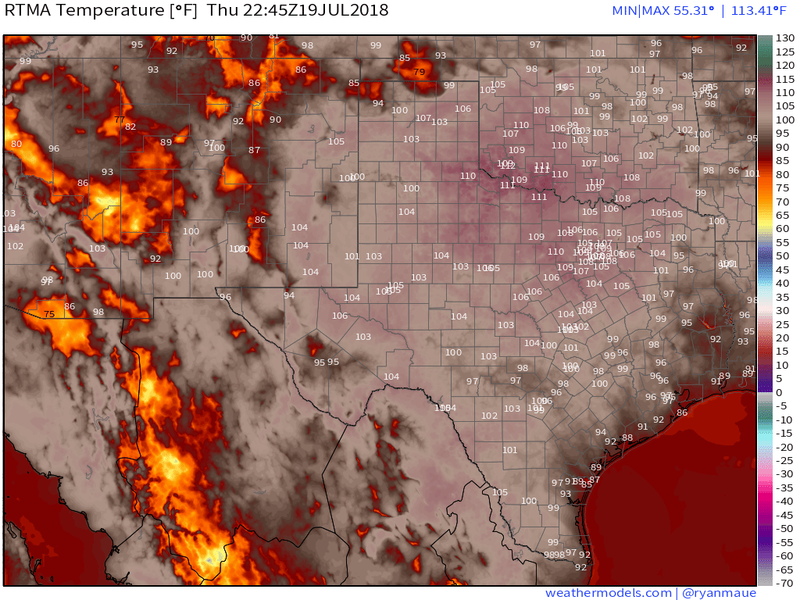 Continued Hot Right Into Early Next Week. For those of you looking for a break from the heat it appears that we won't see that until around next Wednesday (maybe) or so. 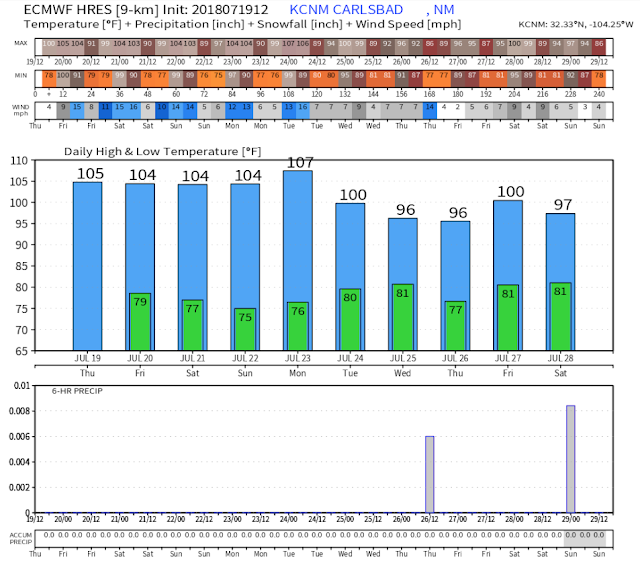 And not much at that with the this mornings ECMWF computer forecast models only dropping us down into the mid 90's. Similar temps are forecast for the rest of the Southeastern Plains by this model over the next ten days...shave off a couple of degrees here and there. 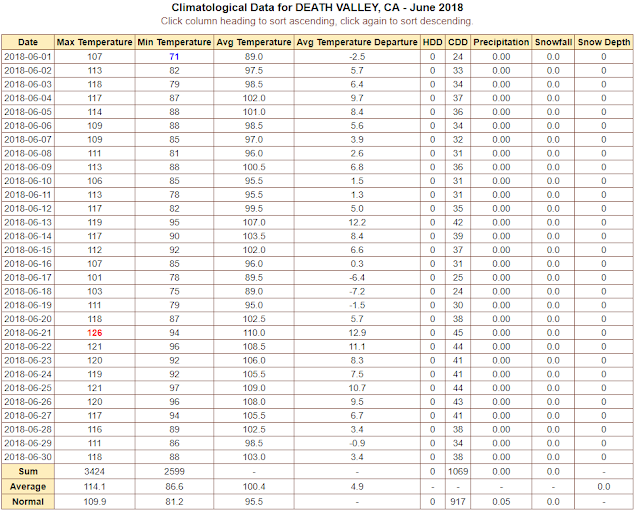 (Check Out Death Valley, California's Temps). 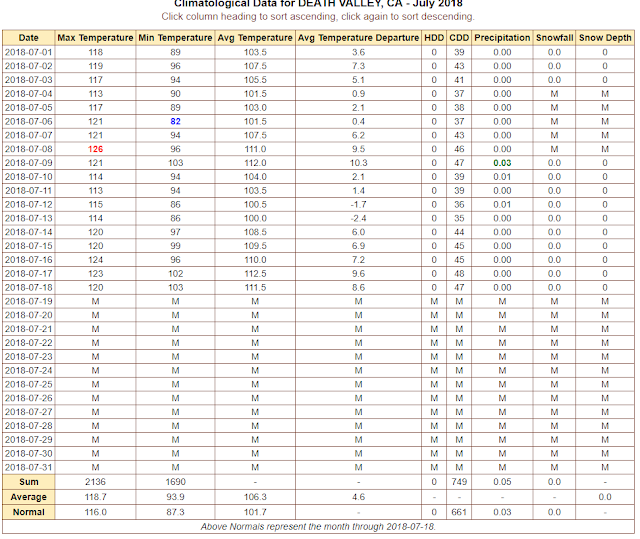 Twice this year (so far) Death Valley has reached 126º. Ouch! How about their morning low temp of only 103º on this past Wednesday morning? After an afternoon high temp of 120º. Talk about horrible sleeping weather. 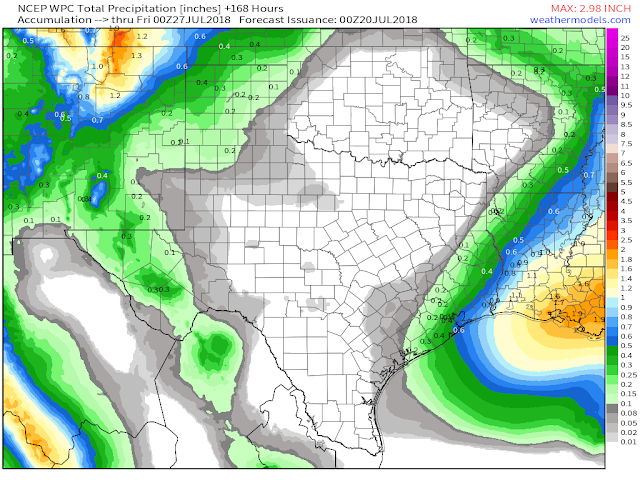 So What About The Rains Returning? Weather Prediction Center (WPC) 7-Day Forecast. A pattern change in the mid and upper levels of the atmosphere may help bring back the Monsoonal flow from Old Mexico back into the area and thus some relief from the heat. 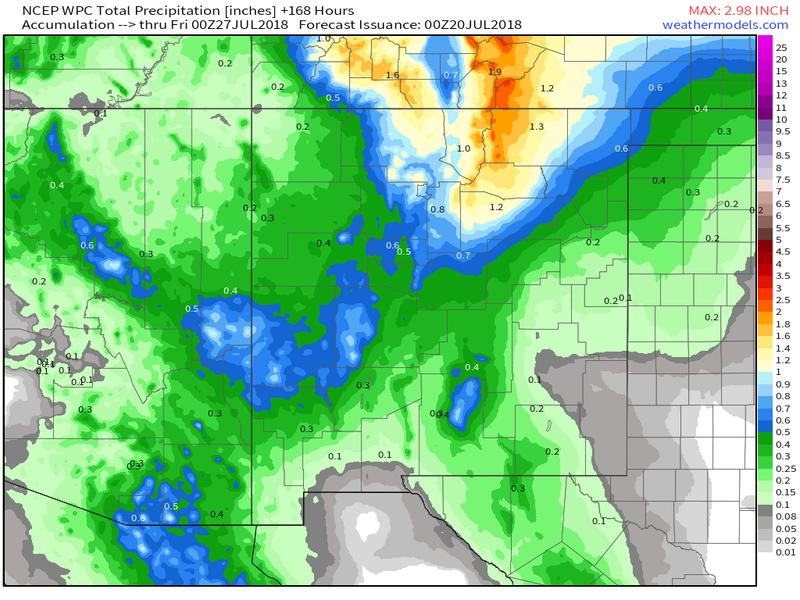 Naturally the most favored areas for decent rains over the next week appear to be the northern mountains, the Gila Wilderness, and the Guadalupe, Sacramento, and Captian Mountains. Hit and miss thunderstorms will be the norm. Mostly miss for the Southeastern Plains. But then again one lone thunderstorm dumping heavy rain in one spot can make a liar out of me in a hurry. (On This Date - July 19th). Our planets weather by any definition is extreme at some point in time. From day to day, month to month, year to year, decade to decade, and on and on it goes. I find it extremely amusing (and sometimes downright infuriating) that these climate alarmists continue their relentless claim that mankind, humankind is messing up the planets climate. Think about just how ridiculous this nonsense is. Really, I'm serious. That is just an absurd argument without any real meaningful scientific backing. And these same people want us to believe that we are all doomed by Global Warming or Climate Change. Even with the best of the computer forecast models we are lucky to get a weather forecast right beyond a week, hardly a month in advance, far much less a year from now, and no way a decade or beyond. Give me a break. The level of ignorance and stupidity on this subject is simply astounding.